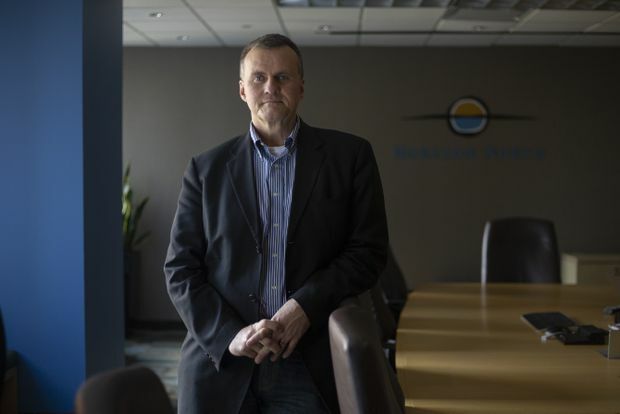 Rod Graham, 51, has been president and CEO of Horizon North Logistics Inc. since 2015. The company provides work-force accommodations, camp management and hospitality to the oil and gas industry, but has recently invested heavily in developing its expertise in prefabricated structures. Mr. Graham is married and has three daughters. I was born in Oakville, Ont., but lived my formative years in Waterloo and Thunder Bay. I went to Wilfrid Laurier University and did an undergrad in business. I had the good fortune of working (a co-op term) for my father in Saudi Arabia – he was Middle East manager for Bell Canada. He came back to Canada the day Saddam invaded Kuwait. I came to Calgary in the fall of 1989 to work for Shell Canada in a co-op term, and I fell in love with Calgary. 1990 was a very challenging time for energy companies. Shell Canada had no full-time position available, so I interviewed with what is now Arc Resources in Calgary. They wanted an engineer undergrad with an MBA – and I had neither. The only reason I got the job was I told them I would sleep under my desk, that I would not rent an apartment and they could have a 24-hour-a-day call option on my life. They held me to that. Had I not worked for Arc for 11 years, and learned what I did, I’d never be in this position as CEO of a company. It was hands down one of the best training grounds for critical thinking. After three years of working there, I went to Japan on an exchange program while working on an MBA from the University of Western Ontario. The ability to tour Toyota, Nissan and Honda factories gave me an affinity for lean manufacturing. That experience in Japan was transformative. A partner and I set up Northern Plains Capital. We rented a car and raised $62-million from 76 high-net-worth individuals in three weeks. We were a couple of guys who didn’t have a company, just an idea. Eventually, we raised $140-million over three funds from 120 investors. I thought for sure that the last 20 years of my career would be in private equity. I was invited to take over leadership of a company that had fallen on hard times – ZCL Composites Inc. It was a complicated turnaround. It was one quarter away from bankruptcy. They had 12 manufacturing plants, including one in Holland, offshore capital, and four currencies that we dealt in. We had 1,000 employees, of which 700 were in the U.S. My day would start at 3 a.m. talking to our executives in Holland and ended at 8 or 9 o’clock at night. For two years, I lived in an apartment in Edmonton, away from my wife and family, managing this business. I put a million and a half of my own money into it, to pay severance. It is in my mind a huge source of pride, turning this around. As a result, I have no fear. I found bedrock at ZCL. Nothing could be worse. Four years ago, I took over as CEO of Horizon North. It was a $100-a-barrel oil company. Times were so good for so long, there really wasn’t a disciplined process. I said [to the board], “Give me five years, and we’ll build a very different company here.” I wanted to create something that was built to last. And it wouldn’t be tied to $100 oil. We didn’t have a mission, vision or value statement when I got here. That was the first order of business. We started with a safety discussion. You do not make money hurting people. Another core value is diversity. Of our 2,000 employees, 15 per cent are Indigenous. Nobody should have to sleep in the street. There is a need for a solution, and I believe we’re part of it. This should be a made-in-Canada solution. [Modular construction in Canada] has been a relatively fragmented business – mom-and-pop. We could be world leaders in modular construction. I believe we can build a billion-dollar company (we have one point of market share; I believe we could capture another three points). There is opportunity for 3 to 5 per cent of [world] market share. We are committed to continuous improvement. We reward our people for continuously finding ways to save costs. How do you eliminate waste? That’s how you build a better cost structure. There’s waste. Grind it out. Best cost structure, best quality. I typically get up at 4-4:30 in the morning, and come to work at 6. I come into work an hour before anyone else does. That’s my time. I go through news feeds, research reports. Thinking time is important for me. I read the arts section of the newspaper. I don’t hunt, I don’t fish, I don’t curl … I hate to say it, but business time is enjoyable. Sitting on the Business Council (of Canada) is a vitamin-B shot for me. But I do find time to be goofy with my kids. My advice to someone is to take elective courses that are 180 degrees away from what you’re doing. Don’t take courses that are all math. You have to be numerate and you have to be literate. My great-grandfather came through Ellis Island. He said: “Work hard, work long, work smart.” If you can outwork somebody, and you can outsmart somebody, and you can outlast somebody, you’re going to win.